The sweet sauce is total comfort food, as if pork belly wasn’t already. The tender meat is rimmed with the skin that gets a little more gelatinous from the braising. The baby cuttlefish adds some chew and bounce. Over rice with some veggies (I used pickled mustard greens in the picture), it’s the perfect lunch. Unfortunately, cuttlefish is an under-utilized ingredient in the US and can be somewhat challenging to find. If you’ve never had it, you can think of it as meatier baby squid. Look for it in the frozen sections of Chinese supermarkets. I’ve actually never seen it fresh. The up-side is that it’s already cleaned and ready to use. Defrost the baby cuttlefish by running it under cold water for 20 to 30 minutes. 1. 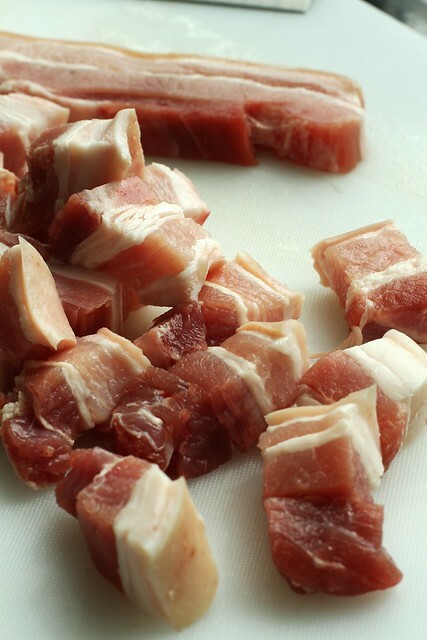 Cut pork belly into 1″ segments. Set aside. 2.Heat oil in a 4 QT pot on medium heat. Make sure the oil is hot before adding the pork belly. Brown by turning occasionally, only flipping when the meat releases itself from the pan. Don’t scrape. This will take about 5 minutes. 3. Add rock candy and stir, allowing the rock candy to melt and coat the pork, about 2 minutes. 4. Add rice wine and stir. Add soy sauce, scallion, and ginger. Stir and cover. Turn heat down to low and allowing the pork to simmer for 30 minutes. Flip meat once in the middle to make sure the other side is soaked in sauce. 5. 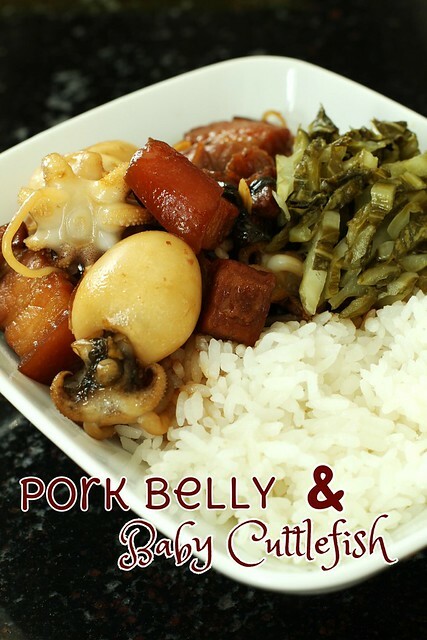 While the pork is cooking, bring a pot of water with a pinch of salt to a boil. Blanche the cuttlefish and rinse with cold water. Set aside. 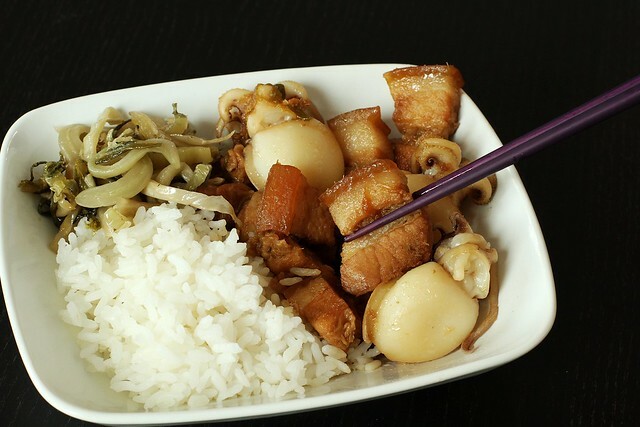 *The pork will keep and reheat well but the cuttlefish is best finished the first time around. This is never a problem for us since Caya devours all the cuttlefish. posted by jessica	at 10:41 PM	Filed under Chinese, Recipes. You can follow any responses to this entry through the RSS 2.0 feed. Both comments and pings are currently closed.